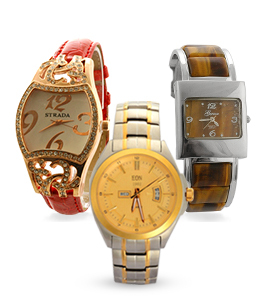 It is time to express yourself with Shop LC's vast selection and fashionable styles of watches. Shop LC brings you watches for play time work time and artistic expression. Sparkling beads shiny metals and gemstone glamour keeping time right there on your wrist. At prices like these you can afford to purchase a different watch for every day. GENOA: Precise Miyota Japanese movement paired with soft pastel colors and elegant watch faces speak to your softer side. STRADA: Limitless designs offer up something for everyone and every occasion. EON 1962: Men's watch collection. 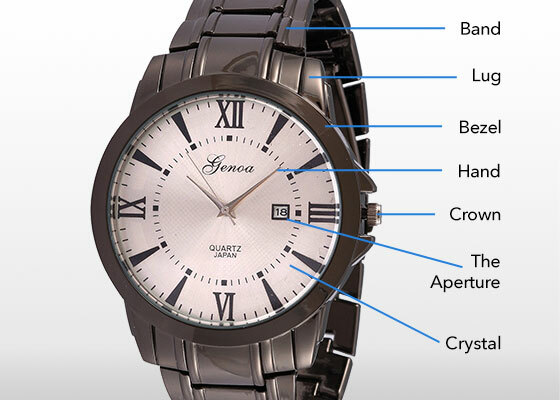 Watches with a timeless look Japanese movement and water resistant. What kind of watch band do you prefer? Elastic Cuff Leather Metal? Do you want a second hand? Do you prefer Roman numerals Arabic numerals or just lines? Do you want multiple bands for color changes? Are you a fan of lots of bells and whistles? Or do you prefer an unadorned timepiece? Waterproof or water resistant? Water resistant means your watch will not absorb moisture quickly while waterproof means it will not absorb moisture at all.